Swimming marathons all over the world is one thing. Winning al lot of races is another. Publicity plays a big part in succes. And in every country it differs. Probably it is very different now a days. But for me it was nice to be noticed. When in the 80’s I report at a match in Canada or Egypt, or wherever, everyone asks me for an autograph. The local fans obviously. The regional publicity involving the matches is always huge. Local sports heroes or other celebrities are invited to give some extra grace to the happening. I have met ice hockey professionals who were really famous in Canada, but probably unknown in the Netherlands. In Italy I got the chance to meet soccer hero Diego Maradonna! Before a race there are press conferences and parades across the city. Or you have to show up at a barbecue of the head sponsors of the match. I enjoy this. Being the centre of attention and feeling important. It’s nice to see that people appreciate you and think it’s impressive that athletes are able to swim such a long distance that fast. In Atlantic City I’m invited by a Dutch chef who has a famous restaurant there: ‘Johan’s’. The restaurant has five stars! During the match I see him walking and cheering along with me. The route nearly passes his restaurant. He thinks this is great because he is so proud of us Dutchmen! Immediately after the match in Magog I’m dragged out of the water and a microphone is pushed in my face. Often I don’t know which language I have to speak. Or I’m too tired and too dazed to think of all those languages. Moreover, my jaw- and mouth muscles are stiff from opening and almost closing my mouth for hours. Especially when the water was cold, it takes some time and effort to get my speech going. I try my best to be understandable and hope I’m speaking the right language. If I have to speak French in Canada, I just gibber a bit. Luckily, I can do it in English then. If you’re half dead or reasonably fit, it doesn’t matter. Even the better when you’re half dead, it makes for nice footage and hilarious texts! The office of La Traversée Lac St. Jean is in the little place Roberval, where the crossing of Lac St. jean is organized. At this office there is a museum which is completely dedicated to the thirty-two kilometres long crossing of Peribonka to Roberval. From 1985 until 1991 this was swim back and forth: Roberval-Peribonka-Roberval, a double marathon of sixty four kilometres. My name and pictures can be admired in that museum. It’s very cool to see yourself that large on a movie screen and to see your pictures hanging on the walls. It makes me proud and makes me realize that I’ve had some great achievements. You want to read more? Go to Amazon.com or your countries Amazon and order quickly!! It took a while, but here it is!! Especially for all my friends and openwater swim lovers all over the world! Enjoy this English version and let me know your experience! Now also e-book at Kindle and Amazon !! Twelve pilots are on the list of the English Channel Association (ECA). The ECA is the official organization you have to apply to. This organization guarantees the safety and makes sure the crossing is done according to rules and regulations. It is required to choose one of these twelve experienced fisherman as your pilot. Because there are more swimmers than fishermen, I am put on a waiting list for my preferred pilot: Val Noakes. Joke van Staveren, the best marathon swimmer of the world at that time, recommended me to her pilot and informed him that I’m a fast swimmer. Dad and I go by his house to meet with him and go over my race. We are received warmly with a cup of English tea with lots of milk. He places me as second on his list. He tells me that a reputable Canadian swimmer who is going to try a triple, Dover-Calais-Dover-Calais, has priority. She is planning on swimming across, back and across again. The agreement is that when there is a favourable weather forecast of thirty-six hours, which is needed for a triple, she can start first and when there is a favourable weather forecast of twelve hours, I am the first who is allowed to dare the crossing. I don’t like that very much, because the weather is beautiful and I want to go first. Lovely sun, little wind and an almost flat sea. The training in the sea and harbour of Folkestone go smoothly. The day of the first possibility to cross approaches. Everyone is watching the weather forecast on TV. There is a favourable weather forecast of twelve hours. I immediately call my pilot. He tells me that the Canadian wants to start first anyway. She wants to set a good time and if the weather remains well, continue for a triple. I’m extremely disappointed, this was not the deal! But the pilot thinks the Canadian is better than me. She does have a state of service, to be honest. I am a nineteen-year-old rookie who hasn’t shown anything yet internationally. And the pilot has the last saying in this, he decides. After twenty hours the weather changes. Wind force six to seven. The Canadian swims across and back, but doesn’t makes the triple. With the following tide, a day later, starting is not allowed because of the tumultuous weather which causes high waves. The following tide neither and the tide thereafter neither. Waiting. I’m getting more and more frustrated that I cannot start. Maybe the weather won’t calm in time. Waiting, waiting and staying in shape. After two days the wind settles down. It’s looking good, but the waves are still tumultuous on the sea. I still have to wait for another tide of six hours. I talk to other swimmers a lot and kill the time by staying in shape and swimming an hour twice each day. The other swimmers point me to the professional circuit. This appeals to me, because this way I can still do something useful with my half-finished swimming career, with my years of training. Finally, Val says there is still one starting chance left. The waves are still there. A chance on a fast time is not possible, but I’m here now and should better just swim it. That way, I’m one of the few who crossed the English Channel and my goal is accomplished. Besides, it’s a great honour. The last possibility approaches. In the middle of the night. At eleven o’ clock the springtide starts. At twelve o’ clock I can start. Pitch-dark. A green fluorescent stick is attached to my bathing suit, as a marker. The water temperature is around sixteen deg degreesi8rees Celsius. From Dover Beach I walk into the water and swim as fast as I can to the floodlight of the fishing trawler. I have never swam in the dark before. It’s actually kind of scary, outside of the reach of the floodlight I don’t have any reference point at all. Just swim. The light shines into my eyes all the time. I can’t see anything. I’m scared to death that I will end up outside the light and get lost in the great, dark sea. Suddenly I see that the moon is shining. It’s a full moon. It feels like I’ve got company, sort of a buddy. I like it and say hi to the moon. The moon changes position. In the beginning it is small, bright and behind me, after five hours it is big, yellow and in front of me. It gives me the idea I’m swimming from one to another point. A reference. A huge mental benefit for me. The waves are still brutal, choppy. The little, choppy point-waves make me heave up and down fast. It makes me sick. Don’t complain, I say to myself, just swim on. We did not pay this amount of money for nothing and this is my chance to put myself in the spotlight. Maybe, the sea sickness will get better later. It didn’t. The pilot and my father have a solution. I have to swim on the other side of the boat. The waves are coming from my side. If I swim on the other side, the boat can break the worst waves. The problem is that I can only breathe on my left side with my crawl and thus should swim on the right side of the boat. On the left side I have to look out over the wide sea. Giving up due to sea sickness is not an option. I am going to try it. It’s indescribably scary to lie in the North Sea outside of the floodlight. I feel panic rising up in my stomach. What if they don’t find me again? I hold back a little bit and swim like crazy to get on the other side of the boat. In the meantime, the pilot moved the floodlight to the other side of the boat. He was right, the waves are broken by the boat just enough to not get seasick. It’s starting to get a little bit brighter outside. Even though I breathe on the left side, I can see the bottom side of the boat under water. This way I can stay on track. It isn’t desirable, but that’s the way it is. It’s good training to learn to breathe on the other side. The race continues. It’s light and finally we see Cap Griz Nez rising up. I have to get on land. But where? Officially I have to get dry feet before the attempt is approved. I only see rocks and the waves are heavy. Climbing on the rocks could be dangerous, there’s a chance of hurting myself. Now what? A few more moments and I will crash into the rocks. From the trawler a dinky is deployed. The pilot and my father sail to me. They lift me out of the water before I crash. The official on the trawler sets the time: 8 hours and 44 minutes. The last 100 meters the zodiac sails with me so I can come as close as possible to the rocks and then climb into the boat so I don’t crash into the rocks. I made it! I am so proud. Although I still feel a slight disappointment because, in my experience, I could have broken the record if I was allowed to start a few days earlier. Achieving is so hammered into me, that settling down with less, is hard. The zodiac takes me to the trawler to sail back to England. I have to hold myself on all sides to not fall over. I am amazed by what I see. Did I swim through these waves? The cold and fatigue get their hand on me now. With chattering teeth, I sit another hour on the boat back to Folkestone. What should have been the end of my career, becomes the beginning of a new one. I have talked to lots of people here in England and I think it’s a rush to be good at long distance swimming. I realize I’m not that bad at all and can do way more than my trainer made me believe in the past. Above all it’s really fun to abide in this small, special word. A variety of people from all kind of countries. In the water competitors, out of the water friends. A taste for more! Moet je altijd mentaal top zijn? Er wordt veel geschreven en onderzoek gedaan naar de mentale factor bij top prestaties. Gelukkig wordt de drempel in de topsport steeds lager om hulp in te schakelen bij mentale begeleiding. Nog te weinig denk ik bij de subtop en lager. In ieder geval is duidelijk dat de balans tussen fysieke en mentale fitheid optimaal moet zijn om top te presteren. Maar is het wel mogelijk om altijd mentaal fit te zijn? Nee natuurlijk niet. Net als het fysiek is het mentale ook wel eens niet om naar huis te schrijven. Is dat erg? Nee, sterker nog, het zal moeten om verbetering te krijgen. Hoe vaak lees of hoor je verhalen van toppers die eerst door een dal zijn gegaan. En zij zijn mentaal sterk er weer uit gekomen. Doch wanneer je in zo’n dal zit ben je mentaal ook niet echt fit. Mijn visie is dat het fysieke en mentale zeer sterk met elkaar verbonden zijn en deze elkaar dus beïnvloeden. Een mens bestaat niet uit een fysiek en mentaal deel namelijk. Het bestaat uit het geheel. Het is van belang dat daar rekening mee gehouden wordt. Wanneer een subtopper zich suf traint en maar net net bij de top komt, moet hij dan nog harder trainen? Of moet hij anders trainen? Of moet er mentale training ingezet worden? Of moet er meer aan de combinatie fysiek/mentaal gedaan worden? Even terug naar de vraag of je altijd mentaal top moet zijn. Dat is in mijn ogen onmogelijk omdat je fysiek ook niet altijd top kan zijn. In periodes van zware training worden er fysiek grenzen verlegd en de psyche moet daarin mee. Wanneer je helemaal kapot bent van een superzware training vergt dat ook iets van je mentale gesteldheid. Op zo’n moment is het belangrijk hoe je het kapot zijn opvat. Je denkt logischerwijs ‘wow ik ben kapot, alles doet zeer, wat vreselijk, ik kan echt niet meer’. Maar dat kan met twee betekenissen op gevoelsniveau. Negatief: dat doe ik niet meer of positief: ik wordt hier sterker van. Het klinkt allemaal logisch en dat is het ook. Maar wat als je fysiek niet klopt met je psyche. Je bent kapot op fysiek vlak en je psyche ontkent het en bedenkt dat er niets aan de hand is. Of andersom je hebt fysiek een topprestatie geleverd (dat is je kapot trainen ook) en je denkt dat het niet goed genoeg is. Hoe zal je lijf herstellen? Zo kan het zijn dat je onzeker bent was en constant gespannen over je eigen kunnen. Er ontstaat een ‘over focus’ en de trainingen verlopen juist te intensief. Je wordt rigide in bewegingen en blessures treden dan sneller op. Die spanning zit zo in het lijf dat ook bij een wedstrijd met een goede mentale voorbereiding het niet optimaal zal lukken. Ik heb zelf een jaar gehad waarbij ik mentaal onverschillig was. Ik kreeg bij de training zware programma’s op, voerde ze uit, maar het kon mij eigenlijk niet zo boeien. Het gevolg was echt dat de training minder intensief was en daarmee de wedstrijden veel zwaarder en moeizamer. Ook al was ik bij de wedstrijden wel goed gemotiveerd. Het lukt dan allemaal net niet en het herstel duurt langer. Wat ik wil zeggen is dat het belangrijkste is om eerst fysiek en mentaal in balans te zijn. Natuurlijk kan je niet het hele jaar top zijn, maar de balans moet wel kloppen. Wanneer je dan uiteindelijk je ultieme prestatie wil leveren helpt mentale begeleiding als ook specifieke fysieke en tactische training. Ik kan helpen deze balans te vervolmaken met neuro-auditieve stimulatie. In eerste instantie de basis leggen voor een goed evenwicht die ook beklijft. Dan specifiek vlak voor wedstrijden om in de bekende flow te komen. Nieuwsgierig? Zou jij dit wel willen uitproberen? Ik ben op zoek naar (sub)toppers die maar niet verder komen om samen dit traject in te gaan! Neem contact op! Tja pfoe Sven. Wat ontzettend jammer en ontluisterend. De tijdstraf van Max Verstappen die hem in Amerika een podiumplek kostte, deed mij denken aan de diskwalificaties van Churandy Martina op zijn 200 meter sprint die hem de zilveren medaille kostte bij de Olympische Spelen en later de Europese titel. Met vier wielen over de rand voor Max en de kleine teen op de lijn voor Churandy. Super frustrerend natuurlijk. Het verschil is wel dat bij Max de hele Formule 1 racewereld op zijn kop staat en in de atletiek men het gewoon accepteert als een regel die is overtreden. “Dit is niet goed. Maar zo zijn de regels. Hoe werkt dat bij de atleten zelf. Er wordt gestreden op het scherpst van de snede, het allerbeste wordt eruit geperst. Het gaat goed, het gaat lekker, op kop, die ene kan nog ingehaald, superfocus, precisie, alles op alles….De euforie van een prachtig resultaat is daar. Grote blijdschap, onbeschrijflijk gevoel van voldoening, trots en emotionele ontlading. Helemaal vervelend is dat de overtreding zo minimaal is dat het waarschijnlijk geen verschil had uitgemaakt wanneer het legitiem gebeurd was. Doch voor iedere topsporter geldt dan uithuilen, opstaan en weer verder gaan. Dat moet. Keihard. Regels zijn er voor een reden. Laat de omgeving maar bakkeleien over de eerlijkheid ervan. Wanneer je als sporter er teveel bij stil staat zal dat de volgende races beïnvloeden. Zowel Max als Churandy bleven dicht bij hun eigen prestatie. het resultaat gaat. Het is de race zelf die de meeste voldoening geeft. Het gevoel dat je plan gaat lukken, dat alles klopt, dat het makkelijk gaat. Dat een regel ervoor zorgt dat het resultaat niet telt doet niets af aan de prestatie zelf. Er is een intrinsieke beloning die minstens zo belangrijk is als de extrinsieke. Maar dan moet je wel zeker van jezelf zijn. Zeker weten dat je het kunststukje nog een keer legitiem kan herhalen. Al is iedere race natuurlijk anders. Heb jij dat ook wel eens meegemaakt? Een superprestatie neerzetten die vervolgens wordt afgekeurd? Deel het hieronder en beschrijf dan meteen hoe je ermee omgegaan bent! Open water zwemmen wordt steeds populairder. Zeker wereldwijd staan er steeds meer ultra lange afstand zwemmers op. Ook ijszwemmen is in trek. Doch zoals de 100 meter vrij het koningsnummer in het zwembad is, is Het Kanaal (ja van Engeland naar Frankrijk) overzwemmen dat voor marathon zwemmen. Wat maakt nu dat dit stuk water bezwemmen zo speciaal is. Waarom heeft het meer prestige dan 24 uur in een zwembad zwemmen. Het feit dat Maarten van der Weijden zijn poging om het Kanaal heen en weer te zwemmen niet eens kan starten zegt al genoeg. De natuur laat niet met zich sollen. Een tijd neerzetten zegt dan ook niet zoveel, al blijft het altijd aantrekkelijk om voor een record te gaan. Het is al heel wat wanneer je de overkant mag halen, laat staan dat je heen en weer of zelfs triple haalt. Dan lees ik ook nog dat er een 40 jarige zwemmer onwel is geworden toen hij halverwege Engeland- Frankrijk was. Er uitgehaald en in het ziekenhuis overleden. Dat hoeft niets met Het Kanaal te maken te hebben. Maar het geeft toch aan dat het fysiek bere zwaar is. Wat zijn nu precies die uitdagingen van het Kanaal. Er zijn fysieke, mentale, organisatorische en natuurlijke factoren Ik heb zelf van alles meegemaakt, twee geslaagde pogingen en één keer onverrichte zaken weer terug. Lees Het Kanaal. Uitdaging 1: Kom zo hoog mogelijk op de wachtlijst bij de schippers. Er is een beperkt aantal schippers beschikbaar om de zwemmer te begeleiden en de juiste weg te navigeren. Deze mensen zijn professionals, meestal vissers, die de wateren op hun duimpje kennen, contact hebben met de kustwacht en goedgekeurd door the English Channel Association. Om als eerste op zo’n lijst te staan moet je veel in huis hebben en lang van te voren boeken. Sta je als tweede of nog verder daaronder is je kans van starten alweer geslonken. Uitdaging 2: Het plannen van je oversteek. Zoals ik al zei het liefst een jaar van te voren als je hoog op de lijst wil staan. Daarbij zijn er drie á vier maanden, juli/augustus/september, in een jaar qua temperatuur geschikt om te zwemmen. In die periode zullen er ongeveer acht keer een week zijn dat het tij het toelaat om de overkant te kunnen halen. Buiten deze periodes om is de stroming zo sterk dat je ergens noord of zuid gedreven wordt, maar niet aan de overkant. Het is het handigst om in zo’n week te plannen en te bivakkeren in Folkestone zodat wanneer de schipper groen licht geeft je een uur later te water kan.
Uitdaging 3: WACHTEN wachten en wachten tot het jouw beurt is om te starten. Dat heb je zelf niet in de hand. De schipper bepaalt of het jouw beurt is, het veilig is en of de mogelijkheid bestaat om de overkant te halen. Altijd paraat staan. Uitdaging 4: De kou. Het water in het Engelse nauw wordt niet warmer als 20 graden Celsius. Meestal schommelt het in de zomermaanden rond de 16 graden. De boventemperatuur is dan wel belangrijk om totale afkoeling te voorkomen. Er wordt namelijk niet met een pak aan gezwommen. Bij open water zwemmen hoort het omgaan met de temperatuur. Maarten van der Weijden bijvoorbeeld wil met pak zwemmen omdat hij denkt niet goed tegen kou te kunnen, sterker nog bang is onderkoeld te raken. Dan elimineert hij 30% van de moeilijkheidsgraad van het fenomeen Kanaal zwemmen. Ik ben benieuwd of dit officieel telt eigenlijk. Vroeger was de regel alleen badkleding, badmuts en zwembril. Maar misschien is dat veranderd. Uitdaging 5: Veranderlijk weer. De pilot bepaalt wanneer er een goede weersvoorspelling is om over te steken, of heen en weer of triple. Daar heb je zelf amper inbreng in. Dat weer heeft enorme invloed op de zee. Het kan het zijn dat je halverwege bent en er ineens een wind op komt zetten met (nog) hoge(re) golven erbij, of dat het plotseling heel mistig wordt. Ook niet fijn als je niets ziet en het kan ook gevaarlijk zijn met al die schepen. Hoewel mist wel weer fijn is voor de zee, het betekent vlak water. Uitdaging 6: Veranderlijke stroming. De te zwemmen koers wordt berekend aan de hand van het getijde tabel. Maar dat tij kan zomaar sterker zijn als op het tabelletje stond. Dat betekent dat je er langer over gaat doen…. Uitdaging 7: De afstand. Het is hemelsbreed 33 kilometer. Met de extra afstand wegens de stroming al snel 40. Dat is op zich een heel eind zwemmen, zonder al die andere uitdagingen al een vak apart. Dat betekent dat je fysiek heel fit moet zijn. Zwemmen is een anaerobe sport. Het hart en lichaam moeten hard aan het werk. Uitdaging 8: Drukke scheepvaartroute. Je steekt even één van de drukste scheepvaart routes dwars over. Dat betekent dat er heel goed link en rechts uitgekeken en gecommuniceerd moet worden met andere schepen en de kustwacht. Een tanker kan echt niet stoppen of uitwijken. Soms moet je dan wachten (of sprinten) De veiligheid staat voorop. Dat is ook de reden dat per keer een beperkt aantal zwemmers mag starten (ik dacht 12). Uitdaging 9: Drijvende objecten. De Noordzee is niet brandschoon. Er drijft van alles. Plastic, hout en ander troep. Als zwemmer zie je niet altijd alles, hoewel het water heel helder is. De coach moet mee opletten. In het donker is dat lastig. Uitdaging 10: Olieveld. Hier en daar zijn er grote olievlekken. Gelukkig niet al te veel. Er omheen zwemmen is een optie, maar al het heel groot is…. Uitdaging 12: Zout water. Tijdens uren in zout water zwemmen krijg je wel eens een slok naar binnen. Gecombineerd met vermoeidheid en golven leidt dat nogal een tot even overgeven. Snel een slok cola! Daarbij wordt je mond van binnen helemaal gepekeld. Uitdaging 13: Zwemmen in het donker. Omdat er een uur na hoogtij gestart moet worden kan je niet zomaar starten wanneer je wil. Soms kom je er niet onderuit om een deel in het donker te zwemmen. Dat kan fijn zijn of eenzaam of angstig. Je ziet tenslotte alleen maar die schijnwerper in je ogen of als je geluk hebt ergens een maan. Uitdaging 15: Mentale weerbaarheid. Met al die bovenstaande uitdagingen is het wel van belang dat je flexibel bent. Natuurlijk staat je doel voor ogen om het te halen. Maar de weg kan anders zijn dan je je voorgesteld had. Genoegen kunnen nemen met minder is daar ook één van. Zo heb ik mijn eerste oversteek moeten aanpassen van recordpoging naar het gewoon maar zien te halen. Maar wel gewoon starten. Wie weet worden de omstandigheden onderweg onverwacht nog gunstiger! Dat kan ook namelijk. En wat denk je van al die uren jezelf mentaal bezig zien te houden. Meditatie in beweging zeg ik altijd maar. Doch een beetje afleiding is ook heel welkom. De coach speelt daar een belangrijke rol in. Wat zou voor jou sportief of in je onderneming de grootste uitdaging zijn? Ik ben benieuwd…. Je kan natuurlijk ook vragen stellen of opmerkingen plaatsen. 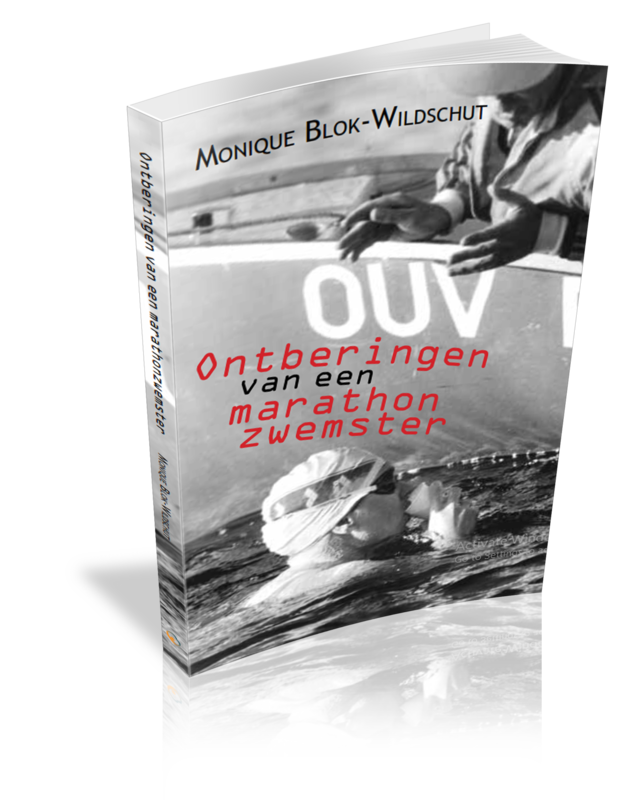 Anderhalf jaar na het uitkomen van mijn boek ‘Ontberingen van een marathonzwemster’ vind ik het nodig om een epiloog te schrijven. Wanneer je deze nog niet van mij ontvangen hebt, kun je het ontvangen door je aan te melden en op het boek hieronder te klikken. Have fun!